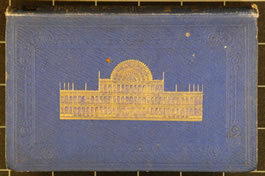 Hunt's Handbook to the Official Catalogues Two volumes bound in blue cloth with design of the building stamped in gold on the front cover. Published by Spicer Brothers & W. Clowes & Sons. Robert Hunt the editor, was described as "Keeper of Mining Records" and author of Researches on Light, The Poetry of Science, Synopsis, etc.